Suction Control Valves - SCV’s control the flow of fuel to the engine driven high pressure fuel pump on a common rail diesel engine. Accelerator Pedal Sensors – APS are mounted on the accelerator pedal and measure the amount of pedal travel. APS communicate with the throttle position sensor which is mounted on the throttle body of the engine which controls the amount of air entering the engine. Exhaust Gas Temperature Sensors – EGT’s are fitted to diesel vehicles with DPF’s to measure the gas temperature in order to control the engine conditions to effectively reduce emissions where possible and to protect components from critical overheating. Electric Water Pumps – EWP’s are designed to circulate engine coolant when the engine is off, such as in automatic stop-start cars, as well as reducing the engine load from a constantly running belt driven pump to improve performance and economy. 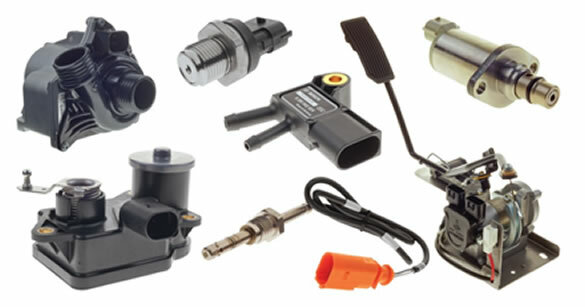 Exhaust Pressure Sensors – EPS are fitted to diesel vehicles fitted with DPF’s. The sensor constantly measures the pressure difference between the intake and exit of the DPF to ascertain whether a DPF regeneration is required. Fuel Rail Sensors – The fuel rail sensor measures the pressure of fuel in the fuel rail and communicates with the ECU, which then tells the fuel pump to increase or decrease output according to engine speed and load, etc. Intake Control Valves – ICV’s can vary the length of the intake tract in order to optimise power and torque across a range of engine RPM’s, as well as help to provide better fuel efficiency. When you supply and fit products from Premier Auto Trade, the Home of Premium Brands, you can expect a product designed and tested to the vehicle manufacturer’s specifications offering superior performance and exact fit every time.